This is actually a trip I did over three years ago now – well, that makes me feel old – but I always think it’s useful to share stories and itineraries for other people who might be planning a trip. ...Or if it’s only ever me that reads this blog, it’s a nice memento. 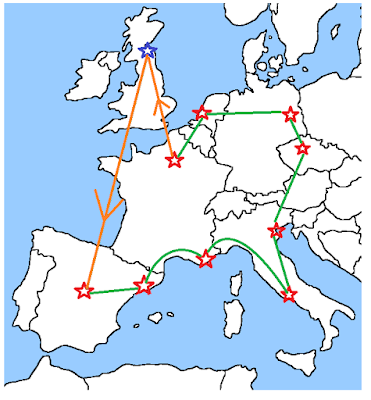 We pretty much stuck around the main cities of western Europe. I have since visited more Eastern countries and they are amazing too, so I suppose what I’m saying is: do as much as you can in the time you have! We were away for just under a month on this trip - not enough I think. We used the 10 travel days in 22 days Interrail pass. Tip: If you’re using a limited day travel pass like we did, remember to fill in your travel days on your ticket. The one time our tickets were checked, Lizzie had fallen asleep before filling hers out and she ended up being fined 50euro by an incredibly stubborn and grumpy train conductor. Tip: It’s useful when you arrive at each new station to find out train timetables for when you might want to leave. If you’ve already got a firm plan, you can book your seats then too. Occasionally, there were trains we didn’t have to book, but most often we would have to book our seats and pay a small booking fee. Obviously for the longer trips (eg. the night train), booking a day or so in advance is important.